Developed in 1989, Murad was one of the very first Doctor Brands, developed by Dr. Howard Murad himself. Dedicated to producing high-performing, breakthrough skincare that brings clinical skincare into the comfort of your own home, Murad transformed the standard skincare regime into 3 stages to skin health: 1. Cleansing & Toning, 2. High-performance Treatment Products, and 3. Targeted Moisturisers. Step 1: Cleanse | Tone – Cleansing has always been the first critical step in a good skincare range. By washing your face twice a day, morning and night, you remove makeup, excess oil, dirt, dead skin cells and impurities that may have built up during the day, and while you’re sleeping. It is important to purify skin of build up to prevent breakouts from occurring. Following your cleanser, a toner will help to restore your skin’s pH balance, preparing it for the next step in your skincare regime. Step 2: Treat | Repair – This is the most powerful step in your skincare routine. During Step 2, you have the power to specifically treat your individual skincare concerns. Whether it be aging, pigmentation or acne, serums and treatments can help to repair existing damage, improve skin health and defend against future attacks. Step 3: Hydrate | Protect – One of the most crucial elements to healthy skin is hydration. Step 3 is all about restoring and replenishing your skin with moisture, no matter your skin type. It is important to also include an SPF product in your routine to shield your skin against harmful environmental aggressors. 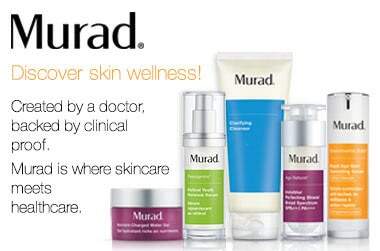 The Murad Skincare formula recipes include three prerequisites: antioxidants, anti-inflammatories and hydrators. To this day, these three key elements are a must in every Murad formula, all the way from Step 1 to 3. One of the most popular ranges within the Murad family is Blemish Control. Created specifically for those suffering from acne and problematic skin, the Blemish Control range works to help your skin become predictable, clear and healthy. Murad was one of the first brands to identify that Environmental Damage was a big factor in skin aging, and thus the Environmental Shield Range was born. His Vitamin C based formulas worked to treat environmentally damaged skin, neutralising free radical damage and boosting antioxidants. Age Reform works to target visible signs of aging, reducing fine lines and wrinkles, building skin resilience and helping to firm and plump skin. Hormonal Ageing is what inspired the Resurgence range, targeting dry, sagging and dull skin as a result of hormonal changes. For skin so healthy it glows, use Murad. I love this under my makeup, really is the best beauty buy! This product makes my lips feel full and plump! I use it every night.